Ukrainian intercontinental ballistic missile. The R-36M2 was the Soviet Union's answer to the American 'Star Wars' anti-ballistic missile system. It was unusually named 'Voevoda' (an old Russian word for the leader of an army) in recognition of its planned role. In the end, it was only deployed in very limited numbers before the end of the Cold War. AKA: 15A18M2;15F173;R-36M2;RS-20V;Satan;SS-18 Mod.5 and 6;Voevoda. Status: Active. First Launch: 1986-03-23. Last Launch: 2013-10-30. Number: 39 . Payload: 8,800 kg (19,400 lb). Thrust: 4,452.00 kN (1,000,849 lbf). Gross mass: 211,100 kg (465,300 lb). Height: 35.06 m (115.02 ft). Diameter: 3.00 m (9.80 ft). Span: 3.05 m (10.00 ft). Apogee: 1,000 km (600 mi). A tactical-technical specification was issued on July 1979 for a fourth generation heavy ICBM to replace the R-36MUTTKh and be capable of defeating future anticipated American anti-ballistic missile defenses. The draft project was completed in June 1982 and featured uprated engines better resistant to nearby nuclear blasts. Decrees authorizing development of the improved RD-263F booster engines was issued in December 1980. The draft project for the redesignated RD-274 engines was completed in December 1982. Development of the RD-274 was completed in May 1985 and the design passed to Yuzhnoye for production (some sources say that problems with turbine balance in the development of the RD-274 could not be resolved, and that the older RD-264 was installed in the production R-36M2). A formal decree authorizing development of the entire missile was issued on 9 August 1983. 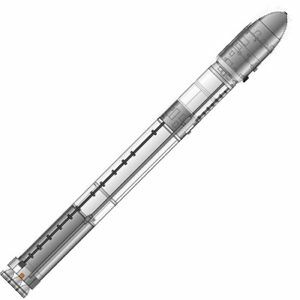 This included the RD-0255 upper stage engine and the four second-stage verniers. The missile would feature a new cold-launch gas generator designed by Zhukov at FTDT Soyuz. Flight trials of the missile with the 15F173 multiple-warhead bus began on 23 March 1986. The first launch was a tremendous failure. The cold-launch mortar fired, but the rest of the launch sequence failed. The missile exploded in the silo, blowing the 100 metric ton silo lid far into the air and leaving only a huge crater at LC-101 Baikonur where the silo once was. The silo was beyond repair. In May 1986 came one of many steps that seemed to indicate anticipation of the disintegration of the Soviet Union. It was decided the alternate 15F175 single-warhead bus, already designed by Yuzhnoye, would be built instead by a Russian enterprise. Test flights with the Ukrainian 15F173 payload were completed in March 1988. The first test with the Russian 15F175 came a month later, and were completed in September 1989. On 11 August 1988 the R-36M2 and 15F173 warhead were accepted for military service, followed by the 15F175 warhead on 23 August 1990. The missile entered service at Dombarovskiy in December 1988, and at Uzhur and Derzhavinsk in 1990. A total of about 190 were built. Although Yuzhnoye developed life extension programs to keep the missile in service for 15, 18, and 20 years, the missile itself was prohibited in in the START-2 arms reduction agreement. Replacement with the all-Russian Topol-M began in 1992 and by 1998 a total of only 58 silos were loaded with the R-36M2. The 150 missiles remaining had to be destroyed under treaty terms by 2007. Russia marketed them as the 'Dnepr' commercial launch vehicle. The missile used a propellant utilization system to minimize residuals. This gave it a total throw weight of 8.8 metric tons, matching that of the US Peacekeeper (an important issue driving its development). The multiple-warhead version could carry up to 20-36 independently-targeted warheads, although no more than ten were planned in service. They were arranged on a special frame in two 'circles of death'. The post-boost bus had four gimbaled chambers, which fired continuously during the warhead dispensing process, making it extremely agile in flight. The missile was equipped with a completely new set of countermeasures, considered more than adequate to counter America's Strategic Defense Initiative. The inertial guidance system was by Vladimir Sergeyev at NII-692/NPO Kharton. The systems were hardened for improved resistance to nuclear radiation or particle beams - the missile could be launched even after near-hits by enemy nuclear warheads. The entire rocket was encased in a heat shield against blasts or laser. The guidance system was equipped with sensors to detect gamma-rays and neutron fluxes and maneuver the missile during ascent away from nuclear explosions. The development was completed on the guidance/countermeasures system for the single-warhead 15F173 dispenser in July 1987, and for the 15F175 multi-warhead dispenser in April 1988. Maximum range: 11,000 km (6,000 mi). Number Standard Warheads: 10. Standard RV: 15F173. Warhead yield: 550 KT. CEP: 0.26 km (0.16 mi). Alternate warhead: 8,800 kg (19,400 lb). Maximum range with alternate warhead: 15,000 km (9,000 mi). Number Alternate Warheads: 1. Alternate RV: 15F175. Alternate warhead yield: 20,000 KT. Alternate warhead CEP: 0.26 km (0.16 mi). Boost Propulsion: Storable liquid rocket, N2O4/UDMH. Cruise Thrust: 755.000 kN (169,730 lbf). Cruise Thrust: 77,000 kgf. Cruise engine: RD-0255. Stage 3 Thrust: 34.300 kN (7,711 lbf). Stage 3 Thrust: 3,500 kgf. Initial Operational Capability: 1988. Total Number Built: 190. Family: ICBM. Country: Ukraine. Engines: RD-274. Spacecraft: SSTL-70, Ekol, Megsat, Saudisat, UniSat. Launch Sites: Baikonur, Dombarovskiy. Stages: R-36M2-1, R-36M2-2, R-36M2-3. Agency: Yuzhnoye. 1986 March 23 - . Launch Site: Baikonur. LV Family: R-36M. Launch Vehicle: R-36M2 15A18M. FAILURE: Failure. 1986 August 21 - . Launch Site: Baikonur. LV Family: R-36M. Launch Vehicle: R-36M2 15A18M. FAILURE: Failure. 1986 November 27 - . Launch Site: Baikonur. LV Family: R-36M. Launch Vehicle: R-36M2 15A18M. FAILURE: Failure. 1987 - . Launch Site: Baikonur. LV Family: R-36M. Launch Vehicle: R-36M2 15A18M. 1987 - . Launch Site: Kartaly. LV Family: R-36M. Launch Vehicle: R-36M2 15A18M. 1987 June 9 - . Launch Site: Baikonur. LV Family: R-36M. Launch Vehicle: R-36M2 15A18M. FAILURE: Failure. 1987 September 30 - . Launch Site: Baikonur. LV Family: R-36M. Launch Vehicle: R-36M2 15A18M. FAILURE: Failure. 1987 December 25 - . Launch Site: Baikonur. LV Family: R-36M. Launch Vehicle: R-36M2 15A18M. SLI - . Nation: Kazakhstan. Agency: RVSN. Apogee: 1,000 km (600 mi). 1988 - . Launch Site: Baikonur. LV Family: R-36M. Launch Vehicle: R-36M2 15A18M. 1988 March 18 - . Launch Site: Baikonur. LV Family: R-36M. Launch Vehicle: R-36M2 15A18M. FAILURE: Failure. 1989 - . Launch Site: Baikonur. LV Family: R-36M. Launch Vehicle: R-36M2 15A18M. 1990 June 12 - . 03:30 GMT - . Launch Site: Baikonur. LV Family: R-36M. Launch Vehicle: R-36M2 15A18M. 1990 August 29 - . 05:00 GMT - . Launch Site: Baikonur. LV Family: R-36M. Launch Vehicle: R-36M2 15A18M. 1990 December 11 - . 07:40 GMT - . Launch Site: Baikonur. LV Family: R-36M. Launch Vehicle: R-36M2 15A18M. 1991 May 28 - . 12:05 GMT - . Launch Site: Baikonur. LV Family: R-36M. Launch Vehicle: R-36M2 15A18M. 1991 September 12 - . 12:45 GMT - . Launch Site: Baikonur. LV Family: R-36M. Launch Vehicle: R-36M2 15A18M. 1991 October 10 - . 11:05 GMT - . Launch Site: Baikonur. LV Family: R-36M. Launch Vehicle: R-36M2 15A18M. 1991 November 28 - . 07:10 GMT - . Launch Site: Baikonur. LV Family: R-36M. Launch Vehicle: R-36M2 15A18M. 1998 April 15 - . Launch Site: Baikonur. LV Family: R-36M. Launch Vehicle: R-36M2 15A18M. Dnepr Demo test - . Nation: Russia. Agency: RVSN. Apogee: 1,000 km (600 mi). 2004 December 22 - . 08:30 GMT - . Launch Site: Dombarovskiy. LV Family: R-36M. Launch Vehicle: R-36M2 15A18M. R-36M2 ICBM demonstration flight - . Nation: Russia. Agency: RVSN. Apogee: 1,000 km (600 mi). The sixteen-year old missile was launched from an operational ICBM base and its dummy warheads impacted in the test range on the Kamchatka Peninsula after a 6,000 kilometer flight. The test was touted as a demonstration of use of the surplus ICBM's, launched directly from their silos, for launch of commerical orbital payloads, in lieu of more expensive decommissioning. Others saw it as the beginning of the development of Dombarovskiy into a new spaceport, on Russian soil, in replacement of Baikonur. 2006 December 21 - . 08:20 GMT - . Launch Site: Dombarovskiy. LV Family: R-36M. Launch Vehicle: R-36M2 15A18M. OT - . Nation: Russia. Apogee: 1,000 km (600 mi). 2009 December 24 - . 06:30 GMT - . Launch Site: Dombarovskiy. LV Family: R-36M. Launch Vehicle: R-36M2 15A18M. RV x 10? - . Nation: Russia. Agency: RVSN. Apogee: 1,000 km (600 mi). Test. 2013 October 30 - . Launch Site: Dombarovskiy. LV Family: R-36M. Launch Vehicle: R-36M2 15A18M. 10 RVs?? - . Nation: Russia. Apogee: 1,000 km (600 mi). Launched from Dombarovskiy to to Kura. One of a series of missiles launched on the same day as part of a large scale Russian military exercise..